Something about the combination of butter and pecan is irresistible. Add those flavors to heavy cream and you have a delectable keto butter pecan ice cream. During the summer of 2017, my wife and I traveled to Charleston, SC for a wedding. We got married there that week too, but oddly enough was not the purpose of the trip. I fully expected the food scene in Charleston to be (as the kids would say) “lit” but it was honestly meh. Except for a place we stopped at called something similar to Ye Ole Dairy Barn. We had just gotten married ourselves and she decided ice cream was in order. Normally I follow along and am the obedient ice cream flavor helper, though I don’t partake. However this time, something caught my eye. Homemade butter pecan ice cream. I decided to splurge (I had just been married, after all) and get a scoop of the ice cream. Not sure what to expect, I just assumed it would be a normal scoop of sugar-filled goodness. It was, in fact. But it was also THE BEST ICE CREAM I’VE EVER HAD. True story. The best I’ve ever had in my entire life. Hands down. No joke. No lie. So, I decided to try and recreate the experience with this keto butter pecan ice cream. I think one of the most important flavors is the browned butter, which really makes the flavors pop. Never had browned butter in a dish before? There’s no time like the present to fall in love with it. This ice cream might take a bit longer than the rest to make, but please, please, please trust me when I say: it’s worth it! You’ll be in love by the time you finish the first bite, I promise. 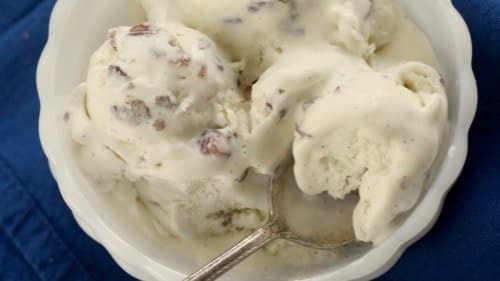 Plan ahead and make this keto butter pecan ice cream for your next dessert. Please do yourself the favor. We need you to make it. We don’t just need you to, we beg you to. It’s all for your own good. Your taste buds demand it. 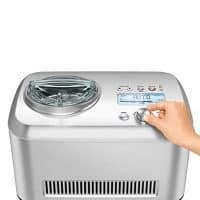 Let the ice cream maker do its thing and enjoy! I don’t see eggs in ingredients? Can i use just egg yolks & when? We removed the egg yolk component from this recipe since several people were concerned about using raw eggs. So, the comments talk about eggs from months back, but the eggs are gone from the ingredient list. You can use Stevia. 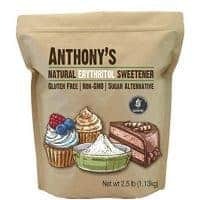 If you are using a powdered form, I would use 1/4 cup to start. Mix in and see what you think of the sweetness. You can add more before you put it in to the ice cream machine. Where do u find pasturized egg yolks? I am really looking forward to making this. Pasteurized egg yolks come from pasteurized eggs, which you should be able to easily find in your local grocery store.